Another Video Nasty! On this week’s episode, the unusually arty low-budget slasher, The Driller Killer. Actually, calling it a slasher is a bit of a misnomer. It’s more of a character study of a brooding artist’s breakdown. This is a weird beast, and not what you’d entirely expect given the era, the budget, and the cast of amateurs involved (save for auteur, Abel Ferrara, the indie legend who went on to direct the infamous, Bad Lieutenant and King of New York). Ferrara (credited as Jimmy Laine) plays Reno Miller. Reno is a tortured artist, tortured by a murky past and an uncertain future. He lives with a harem of girls in the East Village in the height of the punk rock boom in NYC. And he’s surrounded by human misery, squalor and degradation. And that’s just his studio apartment (ba-dum-ching). His milieu is a haven for drug and alcohol abuse, and poverty. But look at the title, folks. Invariably, he descends into madness and…well, you know the drill (bam!) Forgive us that one, dear readers. 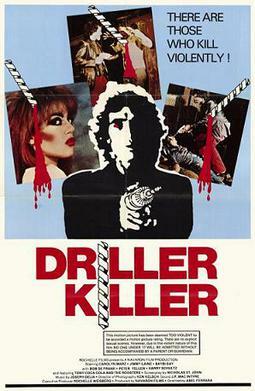 The Driller Killer is worth checking out. Made on a shoestring, with no city permits (guerrilla-style) it has a lot to commend it. As does our podcast, if we may be so bold. 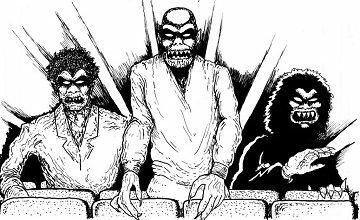 Check out the Really Awful Movies Podcast, for weekly genre chat.